Under the Sky: Blood Moon Coming Up! If you like astronomical events, you will not want to miss the blood moon (or lunar eclipse) on October 8! The moon will pass through Earth's shadow early Wednesday morning (Oct. 8) and no enthusiastic skywatcher should ever miss a total eclipse of the moon. The spectacle is often more beautiful and interesting than one would think. During the time when the moon is entering, and later emerging from, Earth's shadow, some secondary phenomena may be overlooked. 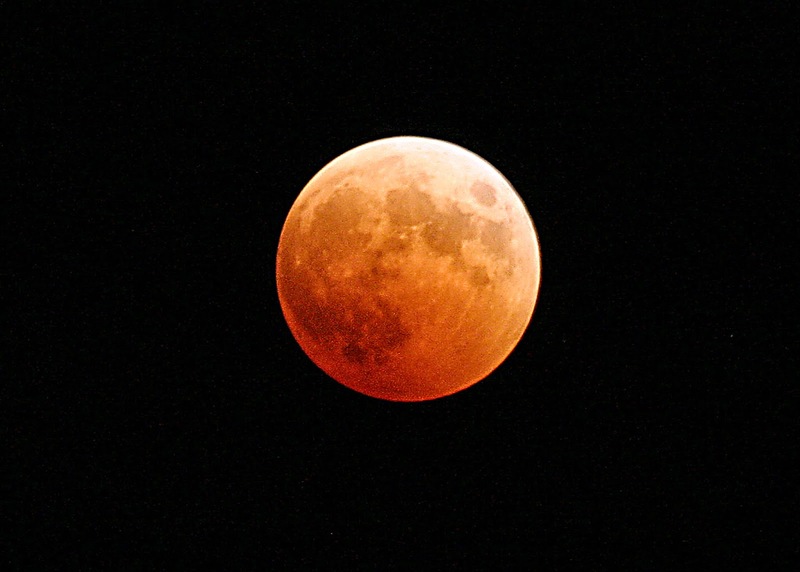 Wednesday's total lunar eclipse will be visible, weather permitting, from much of North America, as well as to observers in Australia, western Asia and across the Pacific Ocean. As a veteran of 14 eclipses of the moon, I know that to get the best out of a lunar eclipse, you should know the major stages of the event. To help you prepare for the eclipse, here is a step-by-step chronology of some of the things you can expect to see, weather permitting. You read more of the text and see a video explaining what will happen in the sky and what is going on at this website. Do you stay up to see astronomical changes in the sky? It is one of my favorite things to do with the kids!